A long time ago (and by that I mean this past weekend) I did this write-up about the various economic and engineering factors that determine at what point an airliner retires and gets sent to the boneyard. Why do airplane boneyards even exist in the first place? There's all this metal sitting around, why not chop it up and turn it into something useful? Or some variation thereof, but pretty closely conforming to this statement. Because I've been asked this particular question so many times, and because Ugh! There's been literally a dozen other people asking me this! Why do you guys keep asking me this?! isn't a very productive answer, I've written this follow-up to delve (just a little, in very general terms) more into the operations of a typical aircraft boneyard. A 1992 U.S Geological Survey Aerial Photograph of Davis-Monthan Air Force Base near Tucson, AZ. AMARG (or AMARC) is the ultimate Boneyard and in fact the facility that more or less set the pattern for all future mass aircraft reclamation centers, both military and civilian. Previously more formally known as the Aerospace Maintenance and Reclamation Center, it's now the 309th Aerospace Maintenance and Reclamation Group and is based at Davis-Monthan AFB just outside of Tuscon Tucson. The facility was established as a "Boneyard" in 1946 right after WWII - the US had thousands of propeller-driven aluminum aircraft produced during the war years, in many cases coming off the production line well after peace was declared and flown straight to the desert. The war was over, and many if not most of these aircraft had instantly become obsolete with jet aircraft. At the same time, immediately scrapping so many aircraft was a logistical nightmare and non-starter right off the bat, and with so many of these aircraft still very new and with a potential new Soviet threat right around the corner, there was a great hesitation to simply melt everything down. The solution was to rope off a huge chunk of sun-parched dirt adjacent to one of the major Air Force training bases and park the aircraft there (with other, similar centers such as Kingman AFB also hosting boneyards). Davis-Monthan and other similar bases in Arizona, New Mexico, Nevada and California were ideal for aircraft storage as these desolate and isolated areas had almost zero property value and were already owned by the US Government; the low-humidity climate acted as a natural preservative for the aluminum especially (UV-sensitive materials such as plexiglas, rubber and other plastics or composites are treated with a material called "Spray-Lat" which as the name implies is directly sprayed on, forming a white protective layer of latex), and being located at major airbases meant all the logistical support needed would be available in a pinch. As it turned out, there was a fair bit of wisdom in the Air Force keeping and preserving all these unwanted planes after all. Many of these planes, such as P-51s and F4U Corsairs, were exported overseas to our allies. The Republic of Korea Air Force, the Republic of China Air Force, the Turkish Air Force, the Aeronautica Militarie (or Italian Air Force if you don't want to be fancy, the Armee de la'Air (the French) and many others all received ex-American warplanes from existing stocks from the end of WWII to, well, today. All these and many others still received parts taken off of planes stored in boneyards which, thanks to the desert, were practically new (or at least still functional with many hours left). 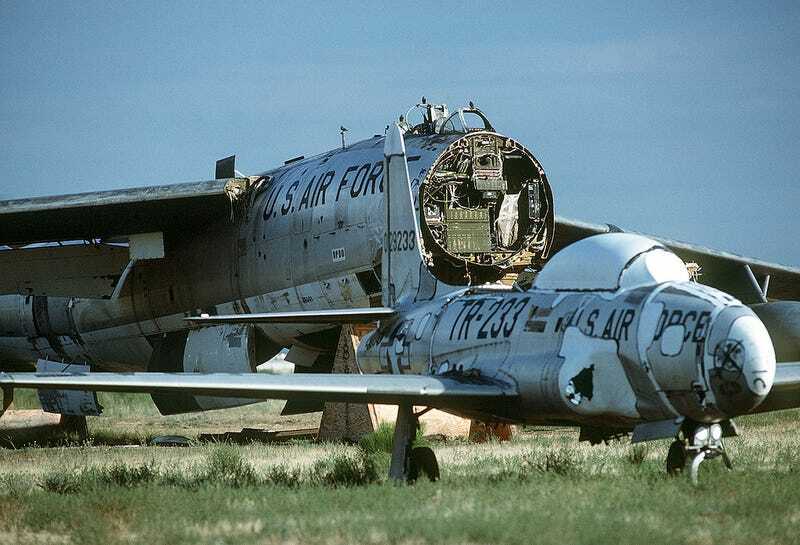 Parts also went back into the USAF's fleet, and as these aircraft carcasses were stripped of everything useful, they were typically shredded by backhoe or other heavy equipment and the remains unceremoniously trucked off to smelting. Having a ready fleet of even obsolete aircraft is very useful. Besides selling them off to other nations (in place of more sensitive or expensive equipment) many of these aircraft end up repurposed into new roles. The F-4 Phantom II defended carrier fleets and the entire nation, but they also served a very useful and important role post-retirement as target drones testing new weapons system or helping to train the next generation of crack fighter pilots (often being reused again and again by simply keeping the warheads off or using electronically simulated attacks). A cargo operator often doesn't care if the plane has spinning props or fancy jets, and many if not most of the DC-3s flying today are actually C-47 Skytrains that formerly served in the Army Air Force or Air Force - and were preserved thanks to boneyards. This goes doubly so for just about every American-sourced warbird or museum display type you see (there are few exceptions, but if you happen to see the Collings Foundation's Vietnam Commemoration Flight you have the boneyard to thank). So as you can see, boneyards have an active role in aircraft historical preservation and aerospace archaeology (yes, aerospace archaeology is a thing). The Southern California Logistics Airport (also known as Victorville Airport) is one of the many civilian equivalents of AMARG at Davis-Monthan. Formerly George AFB (which had also served a boneyard function for the Air Force), it was decommissioned in 1992 for use by the locals including as an airline destination. At the same time, there was also recognition of the need for the facility's continued use as a boneyard for civilian aircraft, namely large airliners. Since its conversion into a civilian airport (though still operated by the Air Force) Victorville has been home to static fleets of airliners awaiting their fate. For most of them, that fate is to be stripped of parts and shredded. New parts for airliners are very expensive, and it's far cheaper to strip them off an existing airliner. Thus, airlines have their own equivalent of an automotive junkyard where they can shop for good, usable parts on the cheap and pass the savings on to the customer. Paradoxically, this has meant that certain airframes (like Boeing 737-600s and Airbus A318s, which are too small for most airlines to turn a profit on but nonetheless share the same parts as their larger brothers) are actually worth more as a collection of parts than they are as whole aircraft. This isn't the fate of every aircraft to rest at Victorville, however. Many do get "rehabbed" and sent back into active service, sometimes with the same airline that put that plane in the desert in the first place, sometimes with another operator overseas. In this way, both military and civilian boneyards save money just like how the local junkyard allows yourself to collect parts for your own transportation means. And just as with many older cars, it's often the only viable way to get spares for older aircraft that have long outlasted their own production lines. Aircraft boneyards don't just supply parts - they also supply local jobs and economical and environmentally-conscious means of recycling old airliners into new goods as well as keeping current fleets flying.